So today is the big day for some of our favorite Tigers. I am so glad they have moved the draft coverage to prime time so we can all watch it at home without trying to sneak it in during work. 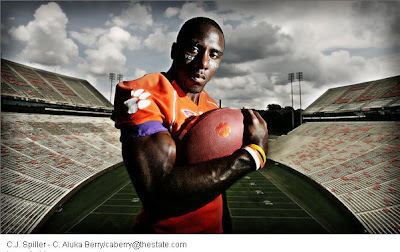 Of course the big question is what team will snag up our beloved Clemson tiger C.J. Spiller, and how soon he'll get snagged. I have a good feeling he'll be picked early. Today's Post and Courier article says, "NFL draft prognosticators have C.J. Spiller being drafted anywhere from sixth to 20th in the first round today." Best of luck to our Tigers! I'll be watching tonight - will you? Update: C.J. was picked by the Buffalo Bills! Pick #9.